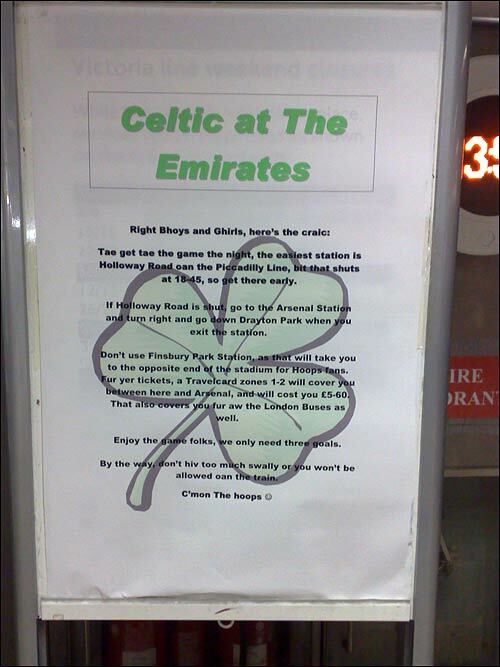 For a while today, Celtic fans managed to redecorate Kings Cross Underground Station with their own take on the important information they needed to know about getting to Arsenal's Emirates Stadium for their Champions League play-off tie. This was around 1:45pm, and sadly, when I passed back through the station a bit later, it looked like there had been a sense of humour #fail. Someone had decided that the official notice about Victoria Line weekend closures it had been stuck over was more important. ha ha! a nice bit of banter from the celtic fans, shame about the sense of humour loss from the authorities. pretty helpful info i thought.